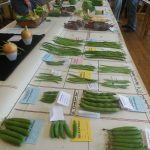 On Saturday 19th August 2017 the 58th South Hill Horticultural Show took to Golberdon Village Hall with 600 exhibits of cookery, vegetables, handicrafts, photographs, flowers and children’s entries from 62 exhibitors. 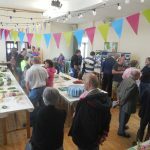 It was great to see so many new faces enter and support the show on the day. 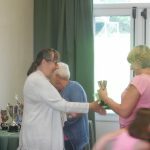 Many thanks to Spar of Callington for donating the joint of beef for the “Guess the weight of the roast dinner” won by Erin Beale and Trevallacks Farm Shop for donating the cream tea for two for the game “Guess how many buttons in a jam jar” won by Josh Gosling. 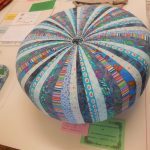 The roast dinner weighed 6.132kg and there were 256 buttons in the jar for anyone wondering how close you were! 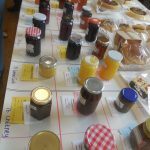 Many thanks also goes to sponsors Helluva Pasties, Janet Harding Alterations, Keltic and Callington Fresh Produce for their sponsorship. If you would like more information or would like to become part of the team, please contact Lucy or Cat Ede on 01579 382182. 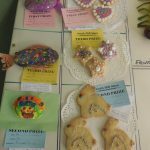 This entry was posted in Children, Food, Gardening, In South Hill Parish, Parish Hall and tagged flower show, Golberdon on August 22, 2017 by AH. 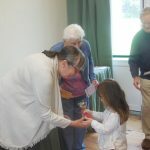 Classes include: Floral Art, Pot Plants, Fruits & Vegetables, Preserves, Cookery, Handicrafts, Photography and new tallest Sunflower Children’s classes include: Animal made from fruit & vegetables, Garden in a seed tray, Recycled model, Handwritten verse, 3 cup cakes, Mini pizza, Lego model, Decorated boiled egg, Photographs. 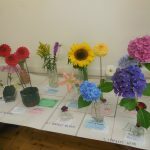 The Sunflower class is an addition to the Horticultural Show Programme, and is open to everyone, the winner will be the plant that has grown taller than the person that planted it. On August 14th submit your entries including your height and the height of your sunflower! 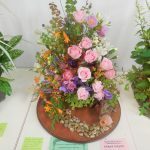 This entry was posted in Events, Gardening, General Interest, In South Hill Parish, Parish Hall, Uncategorized and tagged flower show, Golberdon on June 13, 2017 by AH. 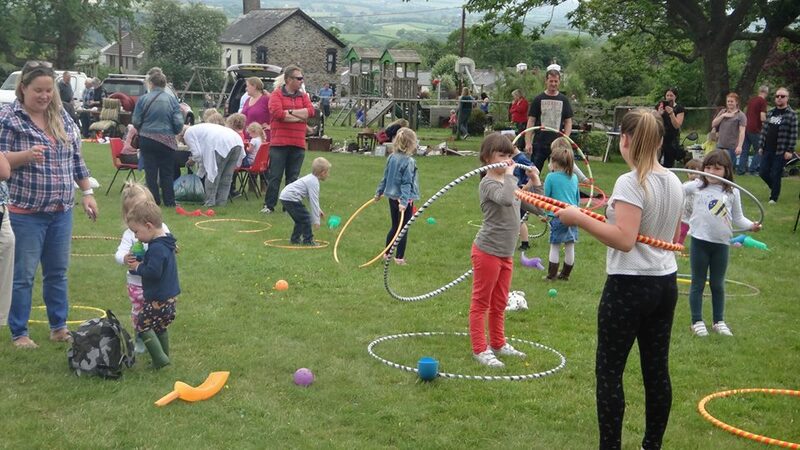 The SHARE in our Community Free Family Fun Day was an amazing success on Bank Holiday Monday. There have never been so many children in Golberdon Park, estimated around 300 people in total, all enjoying the activities laid on by South Hill Parish Renewable Energy community group, S.H.A.R.E. 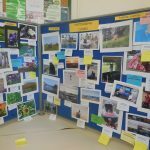 Events centered on energy and money saving tips, recycling and reducing waste, including Kicks Count charity, clothes alterations by Janet Harding, promoting cycling with E Bike demos and bike slalom course, planting seeds, foraging the hedgerows and an energy science project. Plus The Big Beat Junk Band invited everyone to join in and make lots of noise. 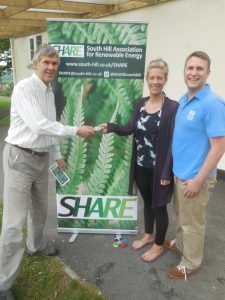 Free Energy Saving Light-bulbs were donated by E-On, sunflower starter kits and grocery Bags for Life, donated by Tesco’s, Morrison’s and Waitrose were given away. 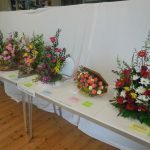 A massive Thank you to everyone that helped make the day so special, to all that donated items, Tamar Organics, Spar, Launceston Cycles, Compton Park Farm Shop, Callington Fresh Produce, our generous parishioners, the South Hill W.I ladies for teas, the South Hill Horticultural Show for including the Sunflower class on August 19th. The car booters, the Police for providing leaflets on protecting property, Project Solar answering questions and giving energy advice and the families that came from near and far and team S.H.A.R.E for hosting such a great fun day. Learn more by contacting enquiries@ProjectSolarUK.com or call Simon on 07955522072. …. 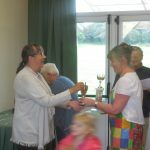 and the 50/50 of 140 pounds was won by a couple from Saltash, visiting for the day. 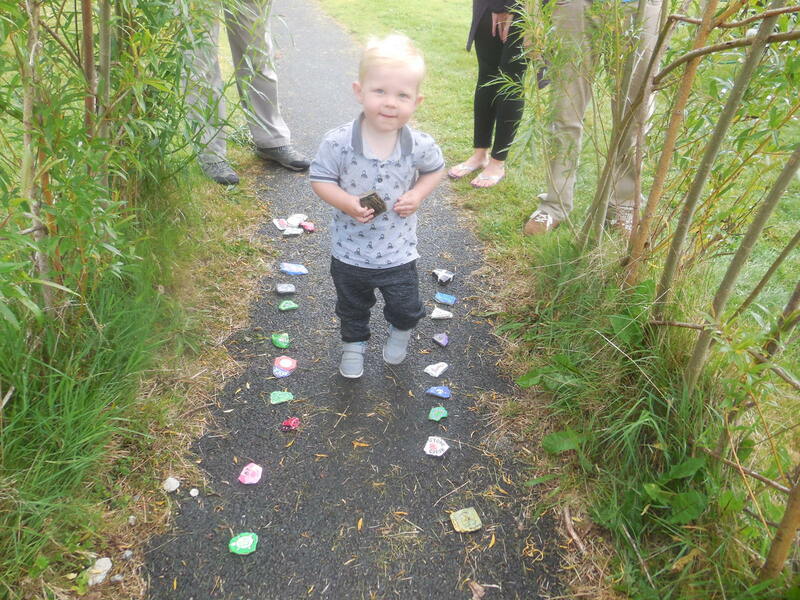 finding and hiding SOUTH HILL ROCKS at Golberdon Park ! 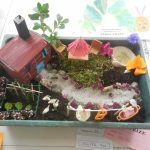 This entry was posted in Children, Clubs/Groups, Community Energy, Events, In South Hill Parish and tagged flower show, Golberdon on June 8, 2017 by AH. 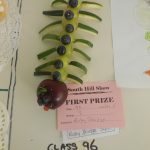 This entry was posted in Events, In South Hill Parish, Parish Hall and tagged flower show, show on September 19, 2016 by AH. Open to ALL and a must on the parish calendar. 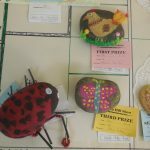 Last date for entries August 15th when you can go to Golberdon hall with your entry forms and money between 6:30pm – 7:30pm. The FULL schedule is available here…. and a hard copy can be picked up from The Show committee members listed on the inside page. 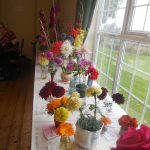 Floral Art, Cut Flowers, Pot Plants, Vegetables, Fruit, Cookery, Preserves, Handicraft, Children’s classes and Photography. 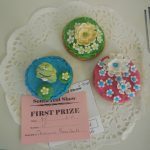 The Cookery item that attracts a lot of interest and entries is class 71 where the show committee give the recipe and method of a given cake, yet the results are always so different. Into a large saucepan add 4oz margarine or butter, 6oz caster sugar, 6oz currants, 6oz sultanas, 2oz mixed peel, 8 fl oz water, 1 level teaspoon bicarbonate of soda, 1 heaped teaspoon mixed spice; bring to a rolling boil and cook for 1 minute. Cool the mixture for 15 minutes, stirring often, before gradually adding 2 large beaten eggs followed by 4oz plain flour, 4oz self-raising flour & a pinch of salt. Stir well then turn into a greased & lined 2lb loaf-tin. Bake in the oven for 1 hr 15 minutes at 140°C. 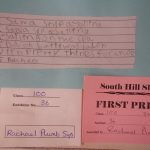 This entry was posted in Children, Events, Food, Gardening, In South Hill Parish, Parish Hall and tagged flower show on June 23, 2016 by SAS. 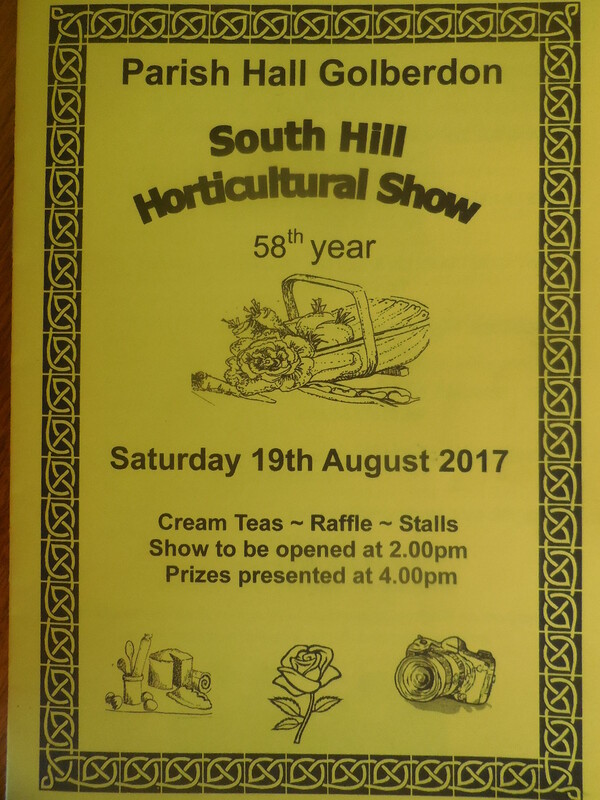 You really know that Summer is coming to South Hill when you find that the Schedule for the Flower Show has been finalised! 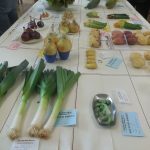 In this 55th year of the Show, you can enter your fruit, veg, crafts and cookery in 116 exciting classes. With 17 classes for children and young people, there’s something for everyone, so start your planning now. The show will take place on Saturday August 16th 2014 at the Parish Hall in Golberdon, opening at 2pm. 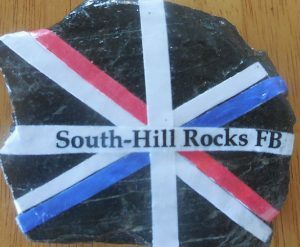 Prizes will be presented by Sheryll Murray MP, at 4.30pm. 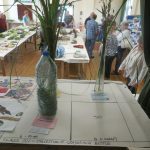 This entry was posted in Events, General Interest, Parish Hall and tagged flower show, show on April 28, 2014 by SAS.